Home of the Borre family, 1342 Ridge Road. 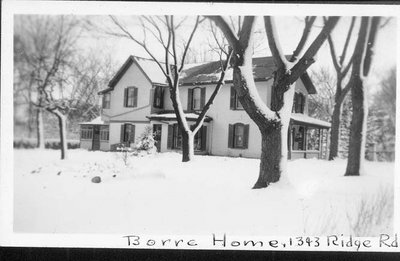 In pen on reverse: "Five generations of the Borre[s] have lived on this site. The original house was a cabin. The present house was build around 1862 on land that was once purchased at $109 for 58 acres. The house is now occupied by John W. Meyer whose mother was a Borre."